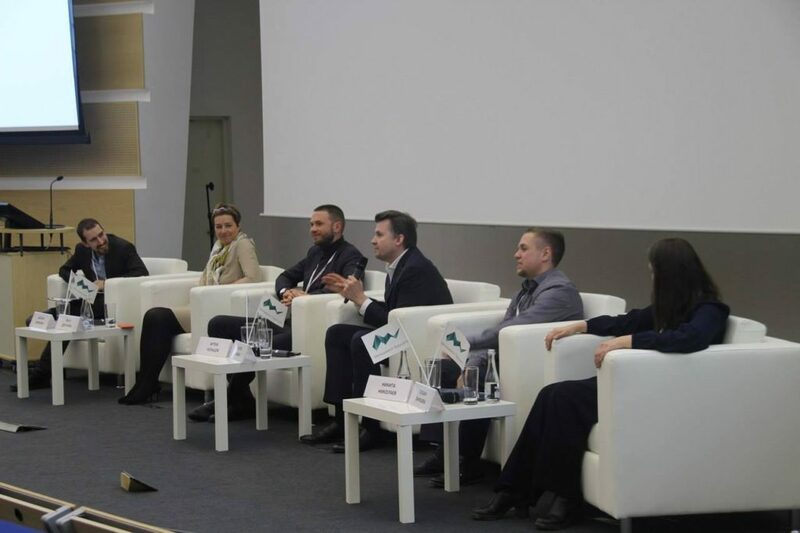 Within the framework of the panel session dedicated to the digital economy, Nikita Nikolaev, director of FscoreLab, took part as a speaker. Nikita shared new methods of using artificial intelligence by corporations and government institutions on the territory of Russia, the prospects for using non-standard techniques to analyze data and accompanying results. Much attention was paid to the digital transformation of business and the specifics of the work of geographically dispersed project teams. The conference participants got acquainted with the specifics and business value of machine learning in applied problems. Not everyone needs digitalization. In the banking sector, IT technologies will become the basis for a new financial system, while it is difficult for the real sector of the economy to adapt to modern conditions. Participants in the profile conference, organized by the Graduate School of Management, believe that the development of innovation causes consumers to inflate expectations. Potential customers are sure – with the introduction of IT products will become cheaper, and services will be faster. However, for example, in the metallurgical industry, the use of robots will not fundamentally affect the production technology, so it is unlikely to speed up the process many times. The same with an autopilot – it will simplify, but will not reduce the transportation of cargo. According to experts, many enterprises use new technologies, not because they really need them, but because they are trying to follow fashion. Earlier in the State Duma, InfoWatch’s general director, Natalya Kaspersky, accused deputies that they are promoting the Digital Economy program, hardly considering that this could entail new threats to business. Representatives of traditional enterprises emphasize that it is possible to assess the productivity of a technology only by integrating it into the full production cycle. Such experiments, for example, in heavy industry are fraught with large losses. Comments on the information technology director of Severstal Management Sergei Dunaev. In turn, representatives of the banking sector note that the old business models will be ineffective in the new conditions. Also in Last year, German Gref refused to develop Sberbank according to the old scheme, proposing to create an “ecosystem” from it. His main competitors are Western technology companies, such as Google and Amazon. To compete with them, credit institutions, finteh enterprises and the regulator will have to cooperate actively, coming up with a new scheme of work in the market. In this they will be helped by the state, It has already assumed the storage of biometric data of customers. The future of financial organizations is discussed by Olga Dergunova, Deputy President and Chairman of the Board of VTB Bank. According to some participants of the discussion, “Management of the Future’18”, managers of business will not be needed in the near future. A kind of coordinator of the work process will be artificial intelligence, while monitoring employees will no longer be necessary. The principles of “debossing” are adhered to, for example, in “Sberbank – Technologies”, where everyone is responsible for the services provided. Whether innovations will take root in the Russian market depends on today’s students who will have to work in fundamentally new conditions, the conference participants summed up. The chairman of the Expert Council on Digital Economy and Block Technologies at the State Duma, Artem Koltsov, continues. Recall, according to the atlas of new professions, which developed ASI instead of with Skolkovo, by 2030 logisticians, tour operators, waiters and bank employees of the lowest level will disappear in Russia. Instead, cybernetic engineers, personal security designers, designers of virtual worlds and producers of the semantic field will appear.